A multi-million dollar arthouse movie by director Ang Lee – Hulk will almost certainly disappoint its target audience but it’s still the most beautiful, intelligent blockbuster of the year. It’s only fair to say that anyone lured to see Hulk by the comics, the cartoons, the various promotional tie-ins or even the 1970s TV show, is almost certainly going to be disappointed, as it’s not an out-and-out superhero movie in the way that Spider-Man or the X-Men movies were. Instead, director Ang Lee (Crouching Tiger, Hidden Dragon) has taken the basic comic-book outline and created that rare beast, a multi-million dollar arthouse blockbuster. In action movie terms, then, it’s a failure, but it’s also one of the most beautiful, intelligent and thoughtful films you’ll see all year. Eric Bana plays genetic scientist Dr. Bruce Banner, unable to open up emotionally to his ex-girlfriend and colleague Dr Betty Ross (Jennifer Connelly) and struggling with disturbing repressed childhood memories of his father, Dr David Banner (Nick Nolte). However, after he’s accidentally exposed to massive levels of gamma radiation his suppressed rage comes to the surface and he finds himself transforming into an enormous, powerful, savage green monster. So it’s lucky he decided to wear the stretchy purple sweatpants. Technically and stylistically, the film is literally breath-taking. The colours are at the same time extraordinarily rich and yet restricted in palette to blues, greens and yellows. Similarly, Lee goes to amazing lengths to recreate a comic-book style panels effect, by using a dizzying combination of wipes, fades, freeze frames, artificial smash-zooms and split-screen work that would put ‘24’ to shame. Some of the fantasy sequences also have an astonishingly surreal, dream-like quality to them – one in particular looks like a Dali painting come to life. The special-effects are equally impressive. After the initial trailers there were fears that the Hulk would look ‘fake’, but, in context, the Hulk is an astonishing, textured, fully-integrated character, who can actually act – some of his facial expressions are unbearably moving. Having said that, ‘running Hulk’ was probably pushing it a bit. 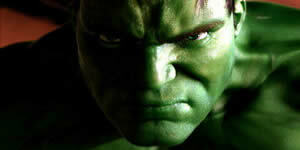 However, the CGI work isn’t restricted to the Hulk himself. A sequence involving the military destruction of Monument Valley is shockingly realistic. Similarly, the out-and-out action scenes are all rendered brilliantly and the effects work never takes you out of the film. It’s a shame he doesn’t actually get around to smashing up San Francisco, but you can’t have everything. The acting is perfect all round – Bana has the most difficult role but handles it very well and Jennifer Connelly is superb as Betty, though it’s slightly annoying that her interaction with the Hulk mostly involves standing still and staring. The supporting characters are equally good, with Josh Lucas (as Glenn Talbot), Sam Elliot (as Betty’s father, Colonel ‘Thunderbolt’ Ross) and Nick Nolte all competing with each other in a scenery-chewing competition with Nolte winning by a country mile. The main problems, at least as far as fans of the TV show and comic book will be concerned, are as follows: the ‘origin’ scene, with Banner saving a lab partner from the gamma rays, is strangely rushed and it’s also strange that we don’t see that character again. Similarly, the first transformation scene, which ought to be a HUGE moment, seems unmotivated by anything – it just happens – and as such is one of the film’s weakest points. Other nit-picky things, such as the fact that the Hulk doesn’t speak (so no “Hulk smash!”) are more understandable, although Lee does throw in a speaking scene that was probably intended as a sop to Hulk Geeks. The worst change, however, is that someone has made the foolish decision to remove the guaranteed-to-raise-a-cheer line “Don’t make me angry…you wouldn’t like me when I’m angry” (a line that was IN THE TRAILER) during a crucial fight between Banner and Talbot. It’s been replaced with “You’re making me angry”, which, frankly, isn’t the same thing at all. The other main problem is that the climax of the film is confusing and muddled - a film like this demands a huge climax and you think you’re going to get one…and then you don’t. That said, if you adjust your expectations accordingly, Hulk is an impressive film and all credit must go to Lee for getting his vision on the screen. Yes, it’s flawed, but it’s still an incredible experience and it makes a nice change to be complaining about a thoughtful, intelligent blockbuster rather than a mindless, lowest-common-denominator one.